Enchanting is the ability to add magical effects to weapons, armor, and clothes. Increasing this skill increases the amount of charges available when creating an enchanted item and the quality of the enchantment that can be placed on that item. The Enchanting skill tree has a total of 9 perks, requiring a total of 13 perk points to fill. Each level in the Enchanting skill increases the strength of enchantments by 0.25% for +25% effectiveness at level 100 compared to level 0. Which enchantments can be applied to a particular item varies by item type. In-game Description: The more powerful the enchanter, the stronger the magic he can bind to his weapons and armor. ^1Only affects new enchantments. Also affects new enchantments on clothing and jewelry despite only specifying armor in the description. ^2Specifically, this affects Fortify Health, Regenerate Health, Fortify Magicka, Regenerate Magicka, Fortify Stamina, and Regenerate Stamina. ^3Allows you to add a second enchantment to an item only at the time of enchanting and for a single soul gem. Already enchanted items cannot be given a second enchantment. ^4This treats all Soul Gems as having 250 greater capacity when used for recharging. ^5Does not apply to kills made with staves. To use the enchanting skill, you will first need access to an arcane enchanter. These stations enable you to both disenchant items that you already have in order to learn their enchantments and create newly enchanted items using the enchantments you currently know. To disenchant an item, all that is necessary is the item that you wish to learn the enchantment of. Open up the enchanting interface at an arcane enchanter, select the option for Disenchant, and select the item you wish to disenchant. Items available to be disenchanted will appear white, while items with enchantments that you already know will appear greyed out. Note that many items, such as staves, artifacts and even most unique items, cannot be disenchanted and their enchantments cannot be learned; they will not even appear on the disenchanting list. 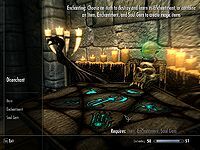 A list of all available enchanting effects as well as which item types can be enchanted with which effects can be found here. Keep in mind that when you disenchant an item, it will be destroyed and you will only learn the type of enchantment that it contained; the magnitude is irrelevant for purposes of disenchanting. An item to apply the enchantment(s) to. A learned enchantment (through disenchanting other items) to apply to the item. To enchant an item, begin by opening up the enchanting interface at the arcane enchanter. Then choose the Item menu option and select the item that you wish to enchant. Note that the type of item you select, be it a piece of armor or a weapon, will determine what effects can be placed upon it. Next, select the enchantment (or enchantments if you have the Extra Effect perk) that you wish to place on the item. If the item you selected is a weapon, then when you choose an enchantment you will also be able to tune a slider before confirming the enchantment. Moving the slider to the left will increase the number of charges that your item has, but decrease the magnitude of the effect applied. Once you have chosen your enchantment(s), you will then select a soul gem for use. When you pick a soul gem to use, the magnitude of the enchantment(s) you placed on the item will be scaled by the magnitude of the soul gem's soul. 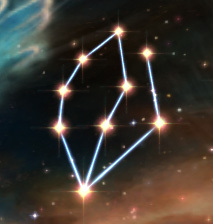 If the soul gem you wish to use is greyed out, then it is not strong enough to enchant the item with your selected enchantment with at least one charge at your selected magnitude; reduce the magnitude, or if you deselect the enchantment, then you can reselect the same enchantment and the magnitude slider will start at the minimum magnitude. As a practical matter, you'll likely want to pick the item, the soul gem, and the enchantment in that order, so that you see the magnitude range already adjusted for gem power. Also, enchantments with no magnitude but a simple on-or-not effect (e.g. Muffle and Waterbreathing) are best enchanted with Petty Soul Gems, as using any larger ones is wasteful. When enchanting an item, you can rename it. The name you choose appears in all capital letters in the enchanting interface, it will use the capitalization you specify in the inventory and favorites menus. The name is limited to 32 characters. 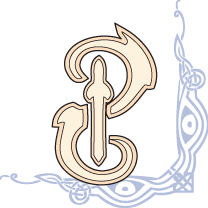 Renamed items retain their IDs at the lower level of the game; a script that checks for possession of an item will still work even after the item has been renamed. Unlike in the rest of the enchanting process, time is paused while the rename option is open, which is handy if you are using a short-lived Fortify Enchanting potion and need time to look over the available enchantments for the item. Type F to enter a name. This may be different if you changed your keybinds. Press Triangle to enter a name. Press the Y button to enter a name. Once you have confirmed all of the features of the item you wish to create, select the Enchant option from the menu to complete the process. Ahzidal's GeniusDB: Increases your Enchanting skill by 10 points. Seeker of SorceryDB: Enchantments are 10% more powerful. Seeker of ShadowsDB: Thief skills are 10% more powerful (affects Alchemy; mutually exclusive with Seeker of Sorcery). Once you have these powers, use the procedure described below to improve the quality of the enchantments you can apply. If you do not have Dragonborn, just follow the same steps without the Dragonborn-specific elements. Wear four pieces of apparel enchanted with Fortify Alchemy (head, necklace, ring, arms). Craft a potion of Fortify Enchanting, and another of Fortify Restoration, at an alchemy lab. If you have Rare Curios, use either Dreugh Wax or Stoneflower Petals to double the fortification effect. If you have Ahzidal's armor set, equip it now. Get four more pieces of unenchanted apparel, one for each of the same slots as before (head, necklace, ring, arms). Drink the potions you just made, Fortify Restoration followed by Fortify Enchanting, in front of an enchanting table. Enchant gear with improved Fortify Alchemy effects more powerful than those you started with. This must be done quickly as time runs normally in most of the enchanting menus. It may take you multiple pairs of potions to enchant all four pieces. The Slow Time shout, with all three words, may allow you to gain a few seconds while doing this. Repeat from step 1 with your new Fortify Alchemy gear. This process has diminishing returns, with the most powerful potion of Fortify Enchanting that can be made, factoring in all possible boosts, being +49% (40% without Vampire/Necromage). Once these potions are made, drink one, ensure that you have all necessary powers (Seeker of Sorcery, Ahzidal's Genius), and then enchant your gear and you will be creating the strongest enchantments possible without taking advantage of glitches. USKP Note: The Necromage perk and Fortify Restoration potions have no effect on enchanting bonuses, while the effect of Fortify Enchanting itself has been modified. The resulting maximum Fortify Enchanting potion with these changes is 44% with Dragonborn; 114% with Dragonborn and Rare Curios. +1 Enchanting reward (as well as +1 to all other magic skills) from Pantea Ateia (Bards College) for completing the quest Pantea's Flute. +5 Enchanting reward (as well as +5 to all other magic skills) if you choose "The Path of Magic" when reading the Oghma Infinium. Crafting enchanted items gives the biggest overall skill increases. Unlike Alchemy and Smithing, enchanting skill increases are unaffected by item value, enchantment used, or soul level of the soul gem used. You gain 1 base XP for each enchantment, which is only affected by other XP enhancers mentioned below. Enchanting an iron dagger using petty soul gems with Damage Stamina or Turn Undead will yield a weapon that can be sold for more than the cost of the material used. Disenchanting items gives highly variable skill increases, dependent on the effect learned and the magnitude on the item, with apparel effects generally giving larger increases than weapon effects. Only one item per effect may ever be disenchanted, however. Recharging enchanted weapons using Soul Gems gives small-to-moderate skill increases, based on the size of the soul used. It does not matter how many charges there are left on the weapon. Using Azura's Star or the Black Star and a weapon with a Soul Trap effect, you can train by recharging the weapon after every kill without having to worry about soul gems. Using The Mage Stone and a sleeping bonus (such as Well Rested) will increase the experience you gain per enchantment. For the purposes of this achievement, disenchanting an item counts as "making" an enchanted item. If your Enchanting skill is at 30 or higher, guards may randomly say, "Don't suppose you'd enchant my sword? Dull old blade can barely cut butter." When enchanting apparel for a follower, note that many enchantments will not work as expected. Most notably, Fortify <Combat Skill> and Fortify <Magic School> enchantments will not benefit your follower. See the followers article for details. Items with enchantments that reduce the magicka cost of spells will also affect charge levels on weapons associated with that school of magic. For example, with an armor, helmet, ring, and amulet all enchanted with at least -25% skill cost in Destruction, Chillrend will have infinite uses. If the enchanted weapon has two enchantments, it is only necessary to have cost reduction in the more powerful/expensive enchantment of two. For example, if you have Paralysis (Alteration) and Fire Damage (Destruction), you only need to have 100% cost reduction in Alteration in order to have infinite charges. The "stronger" enchantment can be changed by modifying the magnitude of the enchantment. In the above scenario, if you lower the paralysis from 4 to 2 seconds, you will need to reduce Destruction cost instead. Use of the staff enchanterDB does not require the Enchanting skill, but still increases the skill when used. Frost Damage, Resist Frost, and Chaos DamageDB enchantments placed on StalhrimDB weapons or armor are 25% stronger than the same enchantments placed on weapons or armor constructed of other materials. Potions that fortify skills by a percent, such as those that Fortify Destruction or Fortify Restoration, will benefit items with enchantments related to those skills. They will also affect the displayed values while enchanting, but the increase will not be permanent. An enchanted item's value is additive in the sense that it takes the base value of the item and simply adds the value of the enchantments to it. 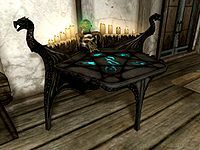 Since the value of powerful enchantments like Paralysis or Banish on weapons is significant compared to the value of the item itself, it's generally more profitable to use less expensive base items. The value of a crafted item decreases incrementally each time the same item is crafted with the same enchantment. The Augmented Flames, Augmented Frost, and Augmented Shock perks directly affect elemental enchantment magnitudes on weapons wielded by actors with these perks. The perks affect the item itself and not the enchantment placed on the item, which means that if you enchant a weapon with elemental enchantments and then acquire the perks later, you will still see an increase in the damage of that enchantment. Because these perks affect the item itself, it will also benefit other secondary enchantments (such as those from having the Extra Effect perk) on the item that are not related to elemental damage. For instance, an item with Fire Damage and Absorb Health as its enchantments, when used by an actor with Augmented Flames, will also see a +50% increase in the effectiveness of the Absorb Health effect. This also means that if you have these perks and then give them to a follower without the perks, the follower does not gain the benefit of the added damage. Destruction perks that activate on elemental damage, such as Intense Flames, do not activate from elemental damage enchantments on weapons. Illusion enchantments are increased by Vampirism's 25% power boost to Illusion magic. This also stacks with the Destruction perks if you make a Fire Damage / Fear or similar weapon. Renamed enchanted weapons (of the same type) that share the same effects but with different names will be named the same if you un-equip both. The game may not recognize keystrokes from your keyboard when renaming an item you intend to enchant. It appears to occur when using the mouse during the process, so try to use only the arrow and Enter keys to name your items. This bug is fixed by version 1.4.26 of the Official Skyrim Patch. Sometimes you will get stuck when trying to exit from using an arcane enchanter and are unable to move or use the HUD. The problem may fix itself in a minute or two, but if not, it's best to save if you can and restart the game. If you find yourself suddenly in first-person view while using an arcane enchanter, zoom out to third person and then exit the arcane enchanter. If you enchant improved armor, the UI may show it reverted to its base specs and it will appear to lose any improved rating you have applied through smithing. However, after enchanting the item, the item will retain its improved rating. This issue has been addressed by version 1.0 of the Unofficial Skyrim Patch; the fix removes the ability to disenchant these items. Disenchanting Necromancer Robes gives the Fortify Magicka effect instead of Fortify Magicka Regen effect. If an enchanted shield is automatically reequipped to the character by equipping a one-handed weapon after switching to a two-handed weapon or spell, the enchantments on the shield may not be applied to the character. If you are dual-wielding two enchanted weapons of the same base type, equip a bow, and un-equip the bow, your weapons may have swapped which hand they are equipped to.